Clear vinyl. In October of 2018, ten years after the launch of their hit HBO series, musical comedians Bret McKenzie and Jemaine Clement returned to HBO for the all-new comedy special. 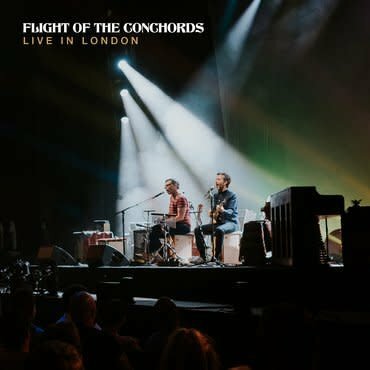 Live in London was taped before a live audience at the Eventim Apollo and featured the Conchords performing songs from the sold-out UK and Ireland edition of Flight of the Conchords Sing Flight of the Conchords Tour. New Zealanders McKenzie and Clement debuted on HBO in 2005 in an edition of the comedy series One-Night Stand, returning to the network in 2007 for the debut season of their acclaimed, Emmy-nominated series Flight of the Conchords, which followed fictionalized versions of their lives in New York City. The duo also signed a worldwide deal with Sub Pop Records for their recorded music, going on to release the Grammy-winning EP, The Distant Future in 2007, followed by two full-length albums - their self-titled debut in 2008, and I Told You I Was Freaky in 2009.